Quirky but excellent pub - now known as Mad O'Rourke's Pie Factory. Well-kept and reasonably-priced ales from Digbrew. 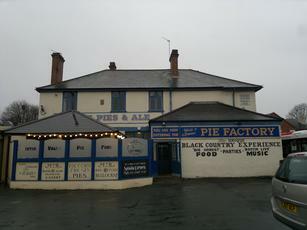 Novel and tasty range of pies. On Wednesdays a 'buy one, get one free' offer makes eating very good value. A must visit when in the area. 10/10. Quite surprised with the fairly low rating on this one. Decent choice of ales (can never remember the names just drink em!) granted quite pricey though. Nice interior and exterior. Foot brilliant and fairly priced. Owner seemed sound asking we were ok and the staff behind the bar polite. Sky sports on in the bar area. awful awful awful went in ordered beer completely sour had my money back from miserable bar staff as I walked out they were still serving the same off beer get a grip owners ! !